Wild: Pteranodon wyvernus is a large pterosaur, capable of flying for incredibly long periods. While others I’ve seen on the island still call it a Pterodactyl, this is inaccurate. Domesticated: I don’t know how they did it, but I once saw a trio of Pteranodons with riders on them. This must be the fastest way to get around the island, but it can’t provide any measure of safety or secrecy. 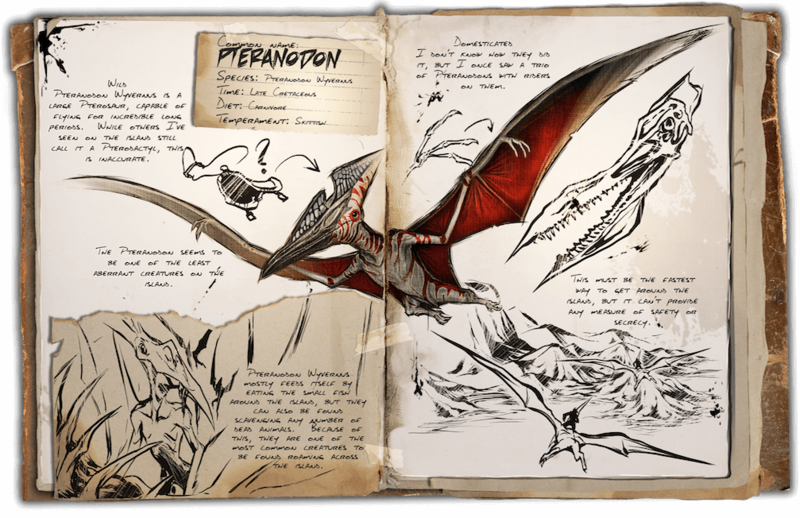 Known Information:The Pteranodon seems to be one of the least aberrant Reptile on the island. Pteranodon wyvernus mostly feeds itself by eating the small fish around the island, but they can also be found scavenging any number of dead animals. Because of this they are one of the most common Creatures on the island.